Now those are some serious bangs, baby. Poor Teyla. This is her bedhead, every morning. Her hair is just so long and curly and has a mind of its own (wonder where it gets that), it's almost uncontrollable. She doesn't seem to mind watching "Martha Speaks" through a wispy curtain, though. Which is a good thing, because I don't think I have the energy to hold her down at 7:30 AM to put her hair in a pony tail. And after spending the last year growing out Natalie's bangs, I don't think I'm going to cut Teyla's hair, either. We cut Natalie's bangs when she was about this age (17 months, for the record). But this time, I'm steering clear of the salon. If only my bedhead looked that cute! But what about the days she wakes up with a runny nose?! Here's hoping Lil Chick can redeem our family hair ratings. I have been stalking your blog but never commented. This post was too funny not to comment. I love her hair, too cute!!!! thank you for this! 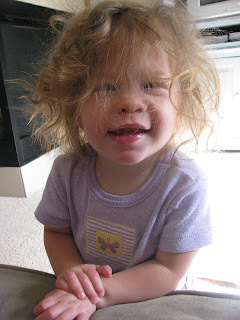 AJ's baby bangs and head o' curly, crazy hair is the same way. I am determined to NOT cut her bangs, but she does look a little sheep-doggish. Thanks for the reminder that it's such a pain to grow those bangs out again. I love it. She's a doll. That has to be the cutest bedhead I've ever seen. Man I love that picture! Pretty cute for a do without a brush--she's so grown up. Hard to believe she's as old as she is, seems like you were just pregnant with her yesterday. Very cute indeed! I would be so tempted to give it a little trim ..... I will probably be in the same boat in about 18 months myself. We shall see. Jordan needed his hair cut at 10 months, with his bangs down below his eyes.